Coast Battle is a free shooting game for Windows 8 and 8.1 computers. This shooting game has been developed and published under the name of ChaoZeng. What is this adventurous game about? 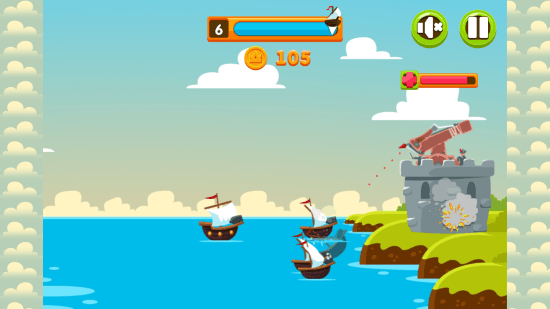 You are in charge of coast guard and you have to protect your territory from enemy attacks from the sea. Fight and destroy all the enemy boats and ships with massive arrows before their wave takes your defense down in this shooting game. This game is an entertaining one, with simple and very attractive graphics. A pleasant classic music plays in the background while you play this shooting game for Windows 8. Getting this hooting game installed on your computer is pretty easy. Its a 5.4 Mb game and installs quickly. All you have to do is go to Microsoft Store and search for this game by its name. You can also click on the download link mentioned later in the article. Once you reach the download page, click Install to automatically download and install the game on your PC. To play this shooting game for Windows 8, you don’t need to waste much time learning it. 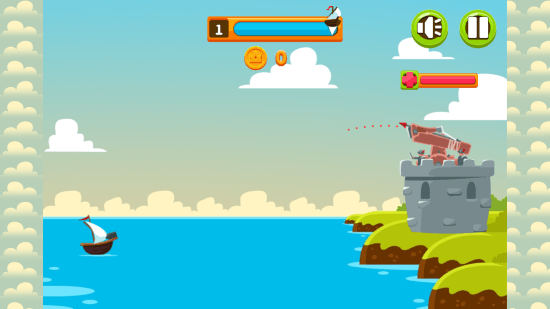 Its a simple shooter game, where you have to aim the shooter in the direction of incoming ship, then click to shoot. All of this can be done with just your mouse. When you begin playing this game, a single boat will appear. The trajectory of the arrow can be set by moving the mouse far, near, up and down from the shooter. Once you thing your trajectory is set, click mouse to shoot. 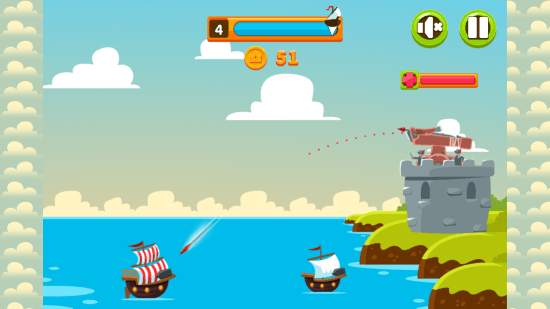 The boats have canons and they start shooting as soon as they reach coast in this shooting game for Windows 8. Your tower can sustain a limited amount of canon shots. Tower’s life can be viewed by the red bar above the tower. So, you have to safeguard the coast without losing the archer tower. As you can see, a group of boats have gathered at coast and shooting the tower. The damage is visible both at the tower and by the life bar. 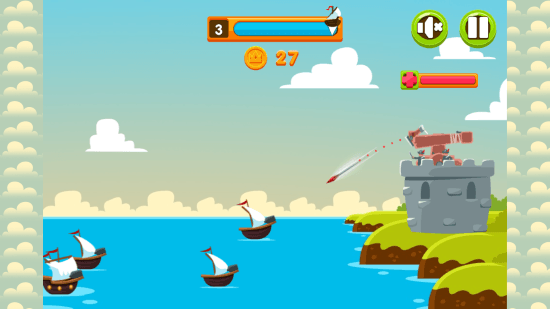 Small boats can be destroyed by a single attack in this shooting game for Windows 8. Larger boats can take multiple hits before they are destroyed. 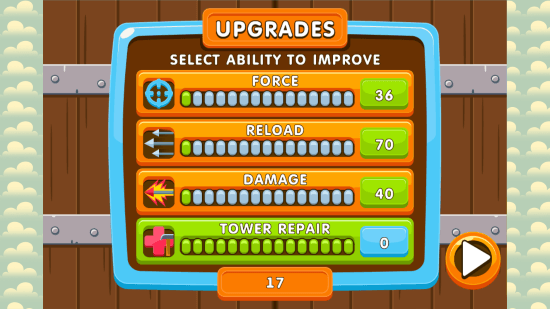 You can also upgrade your shooting device by improving force, reload time, damage, and tower repair. This shooting game for Windows 8 is a good entertainer with nice visuals and background music. The game seems easy in the beginning, but gets difficult as you play it. 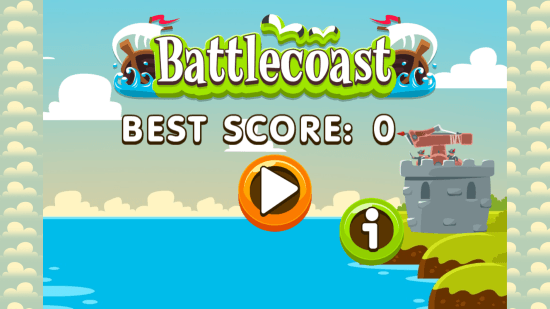 Download Coast Battle for Windows 8 and 8.1 computers.